Ever Wondered What Goes On Within A Beehive? By simply looking at a jar of raw honey, it's easy to not realize just how much has gone into the creation of it. Honey is the result of well orchestrated teamwork between the queen bee, worker bees and drone bees - plus us human beekeepers who help share the tasty stuff with the people of Canada. Within a beehive you’ll find the queen bee, worker bees and drone bees, but what exactly do they all do? The queen bee is Mom and boss. The hive would be lost without the queen, as in, really lost. The queen bee releases pheromones that actually guide the colony, acting like a social glue. The pheromones control the behaviour of each bee. In the rare circumstances when a hive has no queen, the hive’s productivity, safety and size can really diminish. The queen not only guides the colony but also reproduces more and more bees. In the height of summer, the queen could lay up to 2000 eggs a day. But, she can’t do this on her own. For that she needs the help of her drone bees. Drone bees live a sheltered life that consists of eating honey, and reproducing with the queen. While such a simple life may sound envious to some, the drones can quickly reach their mating limit and die. A drone’s sole purpose is to keep the genetics of their family alive and pass it on to the next generation.. For their lazy lifestyle they get kicked out of the hive in the late fall. 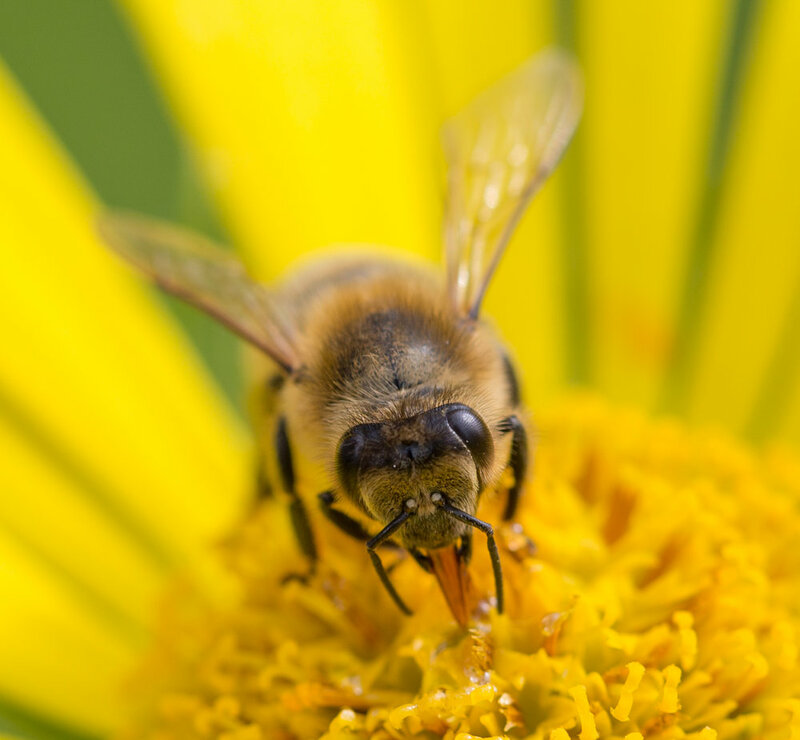 The worker bees are the ones you’re likely to see out and about. They forage for nectar and pollen and return it into the hive to turn into honey for consumption by both the hive and us. These hardworking bees almost always create more honey than needed by their hive and that’s when there is excess for us to use and share with people across Canada. After they return to the hive with their foraged nectar and pollen, they pass it around to other worker bees. This regurgitation helps turn the nectar into a more honey like substance. It will still be quite runny at this stage so bees will flap their wings to create an air current to evaporate the excess water. Then, it will be closed off within the beehive to further process into the typical consistency of honey. Once ready, it will either be shared with the queen, the young or stored in their excess honey area (much like that hard to reach shelf in a cupboard for those bulk items you’re unlikely to ever get round to eating). Foraging is far from being a worker bees only job though. Over its lifetime, they are also responsible for cleaning, feeding the queen and young and defending the hive. It’s once a worker bee gets older that they become hive protector. It’s no surprise that after a life of hard work, they can sometimes get a little agitated when protecting their hive and that’s why these bees are the ones most likely to sting you. Next time you’re tucking into a spoon of Three Foragers raw honey, why not try a raw honey from another part of the country at the same time. You should be able to taste a slight difference. This is because worker bees will collect pollen and nectar from different types of flowers, in different provinces. If you give this flavour test a go, let us know on Facebook if you can taste the differences!